A multitude of reports claim that a LG UltraFine 5K order placed as recently as a week ago will be shipped much earlier than expected, with some people expecting the order as soon as this afternoon. 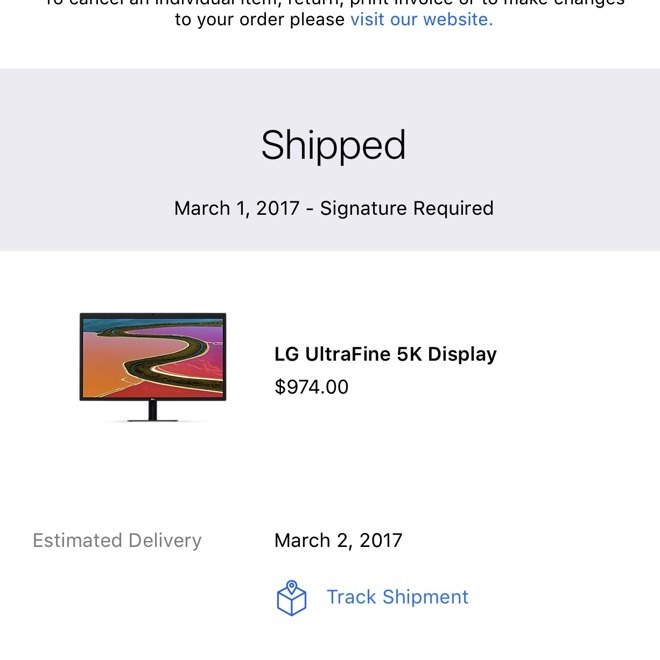 According to several tipsters contacting AppleInsider Apple's prognostications of a delivery by March 10 of the retrofitted LG 5K display are very conservative. Previously slated to start shipping on March 7, one reader informed us that his monitor shipped on March 1, and is arriving on Thursday. As recently as Tuesday morning, Apple's page for the UltraFine 5K display said 2-3 weeks for shipment. While both the Mar. 15 and Mar 16 dates given on the outside of delivery windows fall in that range, it is an update with a more specific date for availability than when they were removed from sale on Feb. 13. The sporadic RF interference problems were first tied to wi-fi networking gear, with some monitors exhibiting connectivity issues with the equipment in close proximity. However, extended AppleInsider testing pointed to about 1 in 4 monitors impacted by the issue, with other powerful radio transmitters also capable interfering with the monitory by "blocking" the frequencies that a wi-fi router uses. The testing facility that AppleInsider is working with ordered four of the new displays to continue the RF evaluation. Originally slated to ship on March 8, with an arrival on March 10, the ship date has been moved up to Friday, with an arrival on March 6. The 5120-by-2880 DCI-P3 UltraFine 5K was first shown at the event that launched the 2016 MacBook Pro, and is currently discounted through the end of March to $974 from $1299. 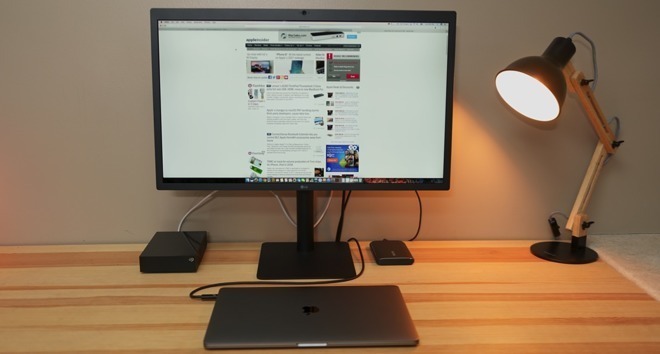 The monitorand was built specifically to connect to one of the 2016 MacBook Pro's Thunderbolt 3 ports, and includes features like a trio of USB 3.1 type C ports, a webcam, and stereo speakers.